Former Harvard captain Michelle Picard '15-'16 will anchor the Metropolitan Riveters' blueline in her sophomore NWHL season. When the Harvard women’s hockey team took on Princeton last weekend, a familiar face sat in the stands. Miye D’Oench ’16, former forward for the team, drove to Princeton, N.J. from her home in New York to watch the Crimson’s first road game of the season. D’Oench’s career with Harvard, a time that saw her lead team scoring in her senior year, is over. But her hockey career goes on. The day after cheering on her former teammates, D’Oench laced up her skates and joined the National Women’s Hockey League’s Metropolitan Riveters in their home opener against the Boston Pride. The Riveters, based in Newark, announced a partnership with the New Jersey Devils this season. The game against the Pride was held in the Devils’ arena, the Prudential Center. For D’Oench and many others, the deal is an encouraging sign of progress for the women’s game. North America is home to two women’s professional hockey leagues: the American NWHL, and the Canadian Women’s Hockey League. The CWHL has been around since 2007, with franchises in Calgary, Toronto, Montreal, Markham, Boston, and, as of this season, Kunlun and Vanke in Shenzhen, China. The NWHL was the upstart American league of 2015, with teams in Boston, Buffalo, Stamford, and Newark, drawing much of the American talent away from the Canadian league. Each league comes with its benefits and complications, however. The CWHL, for instance, did not start paying its players until this season, and the appeal of the NWHL was that it promised good pay—until last year, when salaries were dramatically slashed. The two leagues present a unique challenge to any athlete looking to go pro since the final decision—which league to choose, what team to play for—often comes down to logistics. Crimson tri-captain and Boston Pride draft pick Lexie Laing knows that despite the circumstances being in her favor, much could change in the next year before she can join a professional team. 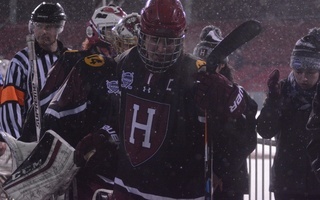 She’s from Massachusetts, and both of her older sisters, former Harvard goalie Brianna Laing ’16 and Princeton graduate Denna Laing, have played with the Pride. On the other hand, Crimson junior forward Karly Heffernan, a two-time U18 Worlds gold medallist for Canada, will also have to think about whether to return to her home country or not. Playing women’s hockey can often feel like the guts without the glory, at least where finances are concerned. Many athletes juggle full-time jobs along with their practice schedules. D’Oench found a job first, and then arranged a trade between the Pride, the team that had drafted her, and the Riveters so that she could keep both her jobs. Others have done the opposite. Knowing that many players are forced to make this compromise, both leagues are structured so 9-to-5 employees can still come to the rink: practices are at night, and games are only on weekends. To Picard and D’Oench, who have only played in the NWHL, this system is good enough. A former Harvard captain and finalist for the Patty Kazmaier Award—given to the nation’s top women’s ice hockey player—forward Jillian Dempsey ’13 has had a different experience. Dempsey graduated as an Olympic hopeful, but found herself cut from the Team USA roster. She turned to the only pro league at the time: the CWHL. Back then, she was playing without pay, like all CWHL players, when rumors of another league started to go around. Miye D'Oench, after leading the team in scoring her senior year, joined the NWHL's Metropolitan Riveters last year. For American players in the CWHL, the chance to play for a league that both paid its players and was based in the U.S. was intriguing, to say the least. But even to attend the tryout meant voiding the contracts they had signed with their current teams, and the athletes were understandably wary. In 2015, the Blades won the CWHL’s Clarkson Cup. Only a few months later, over a dozen of them left for the NWHL. Now, 18 of the 28 players from the Blades’ cup-winning roster play for the newer league. “We were nervous about...whether it was going to be for real, but obviously it was, and it turned out pretty well from there,” Dempsey says with a laugh. With much of the league’s starpower away training for the upcoming Olympics, many women will have their chance in the spotlight. Dempsey is one of them—she captains the Boston Pride this year. 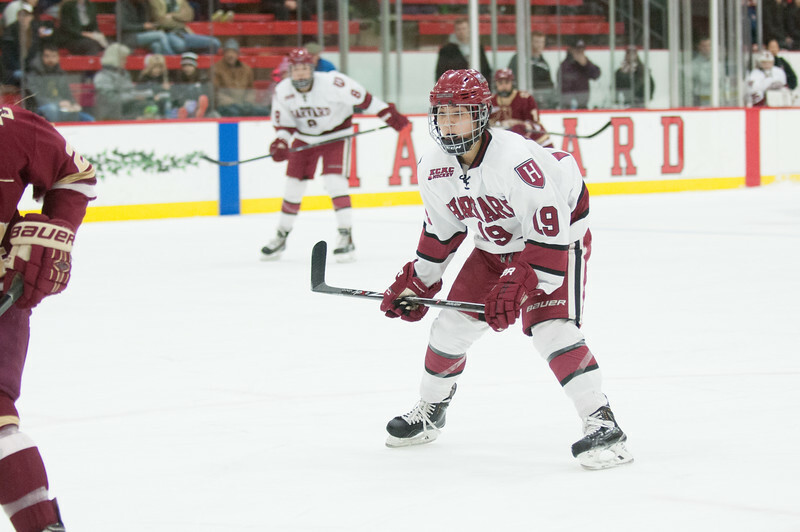 A year after Dempsey left the CWHL, another former Crimson captain joined it. 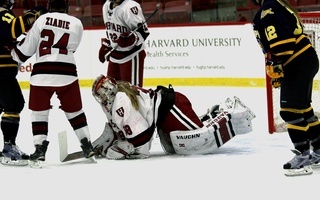 Emerance Maschmeyer ’16, Harvard’s all-time career saves leader, is one of a few dozen players in each league for whom international play is a reality, not a dream. Maschmeyer has won three silver medals with Canada at Worlds and is currently both a goalie for Les Canadiennes de Montréal and an alternate for Canada’s Olympic team. That means she receives subsidies from Hockey Canada and the Canadian government. The netminder is not as financially dependent on the league as others and has time to attend school in between playing. But her position also ushers in an element of unpredictability: she could get called up to play for the national team at the drop of a hat—something that’s already happened this season. Things have fallen into place for Maschmeyer, an Alberta native, who started out with the Calgary Inferno because of the city’s status as the headquarters of Hockey Canada. Now, she’s relocated to Montréal, another massive hockey market. The partnership that the Canadiennes have with the NHL’s Canadiens, she thinks, is significant in a number of ways. Still, it’s not all sunshine and roses. The shiny benefits that the NWHL once advertised—free equipment, good pay—have waned because of the league’s financial issues. When salary cuts were announced last November, players considered a boycott at the same time the U.S. national team was threatening a boycott for fair pay, too. Ultimately, the NWHL schedule went on uninterrupted, but the underlying issues have yet to be resolved. Picard acknowledges that this can be a frustrating experience, having to shelve their concerns in the hopes of growing the game. A major concern of both fans and players is the mere presence of two leagues. It would be easier to acquire viewership if these leagues didn’t have to compete with each other. A country and a league away, Dempsey agrees. Change is certainly on the horizon. The CWHL’s Chinese teams are debuting this year in an effort to cultivate a major fanbase in Asia ahead of the next two Winter Olympics in Pyeongchang, South Korea and Beijing. The NWHL has re-signed with Dunkin’ Donuts and is looking to partner with more NHL teams. For now, Harvard women considering professional careers in hockey will have to prepare for both the gruelling balance of work and play, and the uncertainty of what is to come. That’s a secondary concern, though, if they get to pursue the game they love. No one on the Harvard women’s hockey team has experienced a loss against Dartmouth.